Urban Wronski Writes – Page 55 – New, fearless, fresh and original Australian political comment, satire and more. Got these for ten dollars, says Peter, proprietor of our local post office. I have called when he is busy elsewhere. He has seen me arrive from where he is outside staking young nut trees. He quickly chases after me into the shop. Plenty of time. No need to rush back to your post, Peter. A pun to ease his embarrassment and my awkwardness. Wind’s getting up again, he says. Last night there were gusts to 120 km shaking our little cabin in the woods. It’s a compact house which we like to call our cabin. A transportable, it was built in a factory and placed on site twelve years ago. When the wind blows like this at night it stirs as if it has further voyaging in mind. Bits of broken tree are strewn across the Post Office drive. The winds have tossed a sprig of grey gum leaves, a trophy of chaos theory down like a gauntlet on the ferrous door mat. Peter need say no more. We are already united manfully in the battle against the elements. And a certain bending of the rules of duty are, it is tacitly agreed, are to be expected in the circumstances. It’s every man for himself in the fight against nature. I have dropped in to pick up our shoes. I show him the red printed card, retrieved from our post box at the end of the road that cuts across our road. It feels good to be doing this. We are lucky to get a delivery in the bush. The card lets you know you have an item to collect. You have ordered it, you have paid for it but it seems like a gift. Peter bobs down under the counter and surfaces with a large parcel to his chest. Too large, I fear. We are moved to put our heads down over the mystery item yet it is an uneasy moment. It is too big and too wrong not to be a type of rebuke. Neither of us can manage a word of banter. We peer at each other over the barrier. The size of it on the counter our own brown paper Berlin wall. I read aloud the name on the parcel. He reads it aloud too. It is not my name. But it is similar. I point out that the addressee is lucky enough to have my surname as his first name. Apart from that I don’t know him from a bar of soap. It is the wrong parcel. Peter gets the picture. Not your name is it, he says after an owlish moment. I can see that he, too prefers, bargain bin reading glasses. His would do Woody Allen proud. Peter then finds the correct parcel. It is much smaller and is the right shape to be containing two pairs of comfortable planet shoes. I can tell without needing to read the label that this one is our parcel and not someone else’s. Other people’s mail always looks and feels a bit strange. It is safely put out of the picture. Peter brightens. Yet there is some other redemptive business to be done in the nether regions. Peter looks down, puts one knee forward and points to a brown trouser leg, as if preparing a stage bow. Got them from Vinnies. Cost me ten dollars. Love Vinnies, I return. In fact, I love op shops full stop, I reply. Nothing wrong with recycling. We have bonded over the storm threat. Now we are recruited into admiring the trousers. King Gee khaki, still stiff with the dress in the cotton and shiny with the sanforising. I am aware that Peter is not a big man. There is something elfin about him at this point. Yet this is a serious trouser. I admire his industry and practicality. This needs no words. Besides, we are headed for agreement over bargaining and the battle to save the planet. Work trousers, he says. Second hand but never been worn. Didn’t go looking for trousers. Went in to get a set of steak knives for the caravan. He makes a little step forward on to his toes as if to dance. Nothing worse, I say than a steak in a caravan without a steak knife. Takes the edge right off it. Drives me crazy, he confesses. Of course, I found the knives I wanted. Got a set for $2.50. I point to the flouro top I am wearing. Two dollars in the same shop I tell him. Now we are brothers in the battle to stretch the dollar, save the planet and donate to charity. It feels good to have the right parcel under my arm. Peter skips off, happily, his new trousers cracking, to return to his saving of the nut trees. I leave feeling happy to be in a right priced world where a man gets the right knife to eat steak in his trailer. And the right priced pants to tend his garden. Happy to be in on the bargain. Happy to live in the bush where the local post office is a place where such marvellous exchanges are possible. Ease up on Joe Hockey. Ease up on Joe Hockey. Give him a break. He’s not travelling well, lately. Under constant attack for things he’s said and done. Just look at him. Wounded? He’s bleeding all over the place. And it just gets worse. Just look at his recent fulsome apology on his mate’s radio show in Sydney. Someone needs to rescue him from himself. Someone needs at least to tell him: Joe, the way you show you are a life-long defender of the poor and needy lies in the things you do, not in the word you choose when you think you have to say sorry. Words don’t cut it, mate. If you don’t even get that, Joe Hockey, you are really in serious trouble. Now it is true, many of Hockey’s wounds are self-inflicted. Dancing in your office on Budget night, however, nimbly, creates an image unhelpful to your long-term career prospects. Similarly, acting like a fat cat, kicking back with a cigar doesn’t help you sell budget austerity measures. Nor is it helpful to seem thin-skinned or to cry foul too often. And getting a book out is unhelpful – a distracting and disturbing form of stroking your own ego in public. Hockey’s self-pitying attempts to defend himself only dig him deeper into a hole. Claiming you’ve been taken out of context only add insult to injury. In brief, it is clear so far, Hockey’s manifest talents amount to a gift for self-sabotage. But don’t put the boot in. Hockey is not entirely to blame for his predicament. Some have already dismissed Hockey as incompetent. They say he’s gaffe-prone, innumerate and not across the detail. That’s harsh. And unfair. These things haven’t stopped his boss’s career. But it’s wrong to kick a man when he’s down and it confuses the man with his office. True, there are many ways in which Hockey hasn’t helped his cause. He is not selling the budget. He shows he has limited understanding of key terms such as progressive taxes. He asserts that poor people don’t own cars. It’s a long list. Yet all it goes to show is that Hockey is struggling to get his act together. He clearly still has a fair bit to learn both about his job and how to go about it. Special knowledge is required and that’s not all. The job comes with clear expectations about appropriate and effective behaviour. Hockey is taking a while to get a handle on his portfolio. But let’s be fair. Let’s look at the bigger picture. It hasn’t been easy. He’s had no real apprenticeship. No real mentor. And you can’t really count his performances as shadow treasurer as work experience. The truth is that Hockey has come to greatness a little unprepared. And greatness was thrust upon him in difficult times and circumstances. He can’t even count on the cupboard love of the business world. The cupboard is bare. If he can hardly seem to take a trick these days it is because of the hand he was dealt in the first place. And the rest of the players in the game. 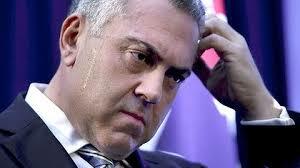 Making Hockey Treasurer was one of Abbot’s wild cards. The appointment surprised many, Hockey included. Nothing he’s ever done then or now has given the impression that he’s good with numbers. This includes his failure to calculate his numbers in the party room when his healthy ego had him tilt at the leadership. But as a way of containing Hockey’s rivalry and taking care of his greater popularity, making him Treasurer was a shrewd career move on Abbott’s behalf. Shrewd but as with many Abbott moves it was neither thought through nor in anyone else’s interests. And ultimately it has come at a high cost to all. Even to Abbott. Even if it were not a setup, being made Treasurer was a huge step up. The job seemed bigger than the man, from the outset. And there was no real job description. No detailed performance plan. Nor time to make one. And Abbott’s leadership has never been nurturing. Nor could it ever be said that ideas were its long suit. The long time in opposition was squandered on sloganeering, negativity and hollow promises. In place of careful strategy and preparedness for government appeared an arresting complacency and arrogance bred of a misplaced sense of entitlement. Hockey was left to fall back on the only trick up his sleeve. Just a Commission of Audit scaring everyone with its dire prognostications. He was left like Chicken Little telling the village that the sky was falling. But Chicken Little did not have a bad press. Just a credibility problem. While it may have been a shrewd time saver in place of a plan of his own, and while it may have been a cunning scare tactic to make the following Budget cuts appear not too deep, the commission of audit did more to alarm than advise. Alarm is not always easy to control. Blend in a layer of self-generated hysteria about the mess Labor left us in and no wonder it’s been hard to sell himself or his budget. Hockey is left with no breathing space. No room to move. Add the many ways his Budget appeared to cut deeply and unfairly. Add the lack of logical consistency. Little wonder since, it’s been a series of stumbles for poor Hockey. Now he’s waffling on radio, pointing the finger at debt-deniers. Hockey’s mentors have taken to telling us to ease off. This is unhelpful. Recent efforts by Julie Bishop, for example, and Amanda Vanstone have been misguided. Indeed, their ‘ease up on Joe’ line may prove fatal. Such efforts mark Hockey as a failure, a man whose colleagues have to bail out when he is trouble. Worse, their tone makes Hockey appear to need special protection, like some pet favourite who deserves to be cossetted at home, not kicked by the big boys in the playground. The enfant terrible, only mothers could love. Disturbing is the implication that we should make allowances for Hockey. Not only does this further disempower him, It contrasts alarmingly with the way Hockey appears to treat everyone else. Defending Hockey is counterproductive on several levels. Others are wasting their breath telling critics they are being unfair to Joe. Hockey is pretty good at doing that himself. Attempting to protect him now, moreover, merely serves to extend the sense of privilege and entitlement which have dogged so many of his attempts to communicate his capability for the job. And blinkered his apprehension of the facts of life. What Hockey needed was good advice from the start and some decent role modelling. Instead he had Tony Abbott’s empty rhetoric, sloganeering and contempt for evidence, be it scientific, moral or economic. No. Abbott was not a good role model. Not even for himself. Instead he gave Hockey the poisoned chalice of a job he was ill-suited to and poorly prepared for. Beyond this he conferred the tactical handicap of Abbott’s attraction to underestimating the electorate and skimping on detail. Ever economical with the truth, Abbott may well have seduced Hockey into acting as if the facts don’t really matter. The subtext appears to have been too well-heeded by his acolyte. “Don’t overestimate their intelligence or their attention span Joe. Keep it simple. Keep repeating it. Frighten them, Joe. Look at the run I got with the carbon tax. Look how we stopped the boats.” Yet following his leader could well prove lethal to our would-be Treasurer. As many have noted Hockey has an image problem. But it’s deeper than that. His substance is also deeply problematic. Yet could anyone reasonably have expected otherwise? Raised in the hothouse atmosphere of an opposition which never had to account for anything, trained by a party leader who was never a positive role model yet buoyed beyond all reasonable expectation by his own unfettered ambition, Hockey is the enfant terrible of modern Liberal politics. He is the Treasurer we had to have. But not the treasurer he or his party or the country needs.